Today, Wednesday July 11, the Irish Society for the Prevention of Cruelty to Children (ISPCC) welcomed the launch by An Taoiseach Leo Varadkar TD of the government’s first Action Plan for Online Safety, while calling for a further firm commitment to be made on establishing statutory regulation of internet and social media provision, and a Digital Safety Commissioner with real authority. The Action Plan for Online Safety, as published today, highlights a series of commitments by government to make children safer online. These include a single online access point for online safety information and resources; development of training modules for schools along with enhanced curriculum at both primary and secondary level; law reform to include statutory child safeguarding statements having to specifically account for online safety; commitment to work with European Union and international partners on online safety policy and the establishment of a new National Advisory Council for Online Safety. ISPCC Director of Policy, Cliodhna O’Neill said: “Today is an important step forward for online safety, and we acknowledge much that is good in this plan, though we must reiterate that a strong commitment to regulation of industry is needed to keep children safe online. For several years, the ISPCC has described online safety as the child protection issue of our time, and called for enhanced regulation, enhanced education measures and law reform, as part of a national strategy on online safety. “Today’s plan goes some way towards addressing these concerns. We welcome these warmly and acknowledge the work that has been done across government departments and by members of the Oireachtas and the media in understanding our concerns and helping to raise awareness of and take action on this issue. “As the national child protection charity, the ISPCC cannot support the approach that this plan takes in favouring self-regulation of industry over legal regulation, citing good practice in this area as the reason for this approach. We recognise that there is some good practice in this area, but experience shows that legislation and regulation is needed to ensure consistent compliance by all providers. A Digital Safety Commissioner with real powers and authority would be required to ensure this. There is support in this plan for some aspects of such an office but this may not go far enough. “The goal of having 95 per cent of providers signed up to a voluntary code is not sufficient. The vast majority of citizens are law abiding, yet we have laws in place. While it is clear that technology changes quickly, there is little explanation for this approach. Broadcasting is regulated. Legal standards are in place for children’s toys. Yet aspects of the technology industry are not regulated, and the industry will continue to be permitted to act according to a code that is self-written, self-enforced and largely self-evaluated. Take down procedures are not standardised, transparency measures are not standardised, and can be changed at whim. There is a lot of reference to industry involvement, and no mention of child protection expert involvement. This does not provide a sufficient level of protection for children. “We recognise that though there is a focus on what can go wrong, on illegal and harmful content, the potential benefits of being online and of responsible and ethical use of technology are enormous. Children deserve to be able to enjoy all of the learning, recreational and social benefits of being online – and it is the role of adults to make it safe for them to do so. The plan contains practical measures to support education and parental awareness and we welcome these. From the ISPCC’s interactions with children and parents and its research, it is clear that the actions outlined in this plan are needed. 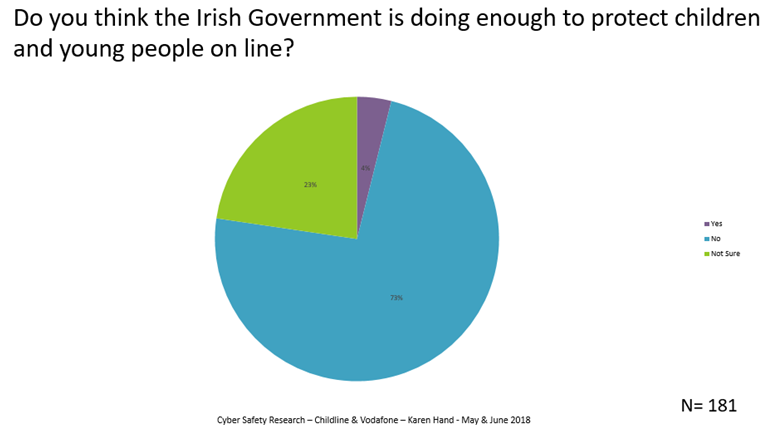 Forthcoming research commissioned by ISPCC Childline and supported by the Vodafone Ireland Foundation shows that 73 per cent of parents do not believe that the government is doing enough to keep their children safe online, (see chart below). The research also shows that preferred sources of online safety information for parents would be school (70 per cent); online safety websites (52 per cent); government (47 per cent) and internet service providers (45 per cent). This demonstrates that parents feel there is a clear need for online safety to be formally included on their child’s curriculum; that resources on online safety should be officially developed by government, while internet service providers also have a key role to play in supporting parents to keep their children safe online. The ISPCC is also mindful of the role parents can play in their children’s online safety. They have a wonderful opportunity when giving internet-enabled devices to their child to explore the safety features together; inspire them with the potential opportunities available and discuss the associated risks and equip them with options for when they do come across something online that worries or concerns them. We continue to support parents and young people on a daily basis on this issue. The ISPCC welcomes the acknowledgment in the plan that online safety is not an issue for Ireland alone. It must be tackled as a global issue and government must collaborate with European and international partners in a combined effort to make online safety a priority across all administrations. Ms. O’Neill concluded: “What is needed now is clear: implementation of this action plan as a first step, a concerted effort from all government departments to work together cohesively and efficiently to create the necessary change, the active and engaged involvement of industry, including child protection experts, and enhanced regulation, to better protect children online.